Of all the Morey’s Piers properties, Blue Palms Resort & Boardwalk Bungalows is the closest to the rides, slides, thrills and spills. 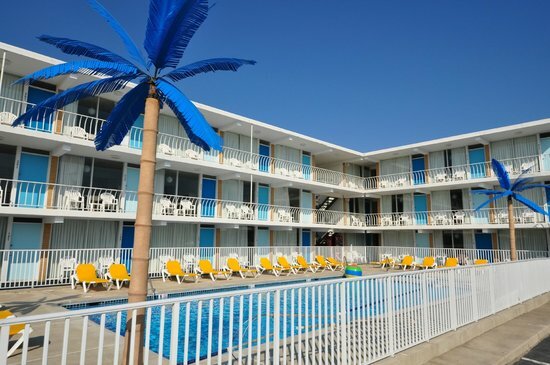 Located just one block back from Mariner’s Pier, where you’ll find the Giant Wheel, and one block to the side from the Splash Zone water park, the traditional motel is a budget- and family-friendly place to stay in Wildwood. The Blue Palms incorporates the classic Doo-Wop style kids and families may have seen in re-runs of the Brady Bunch, with plastic blue palm trees surrounding the pool and retro-style furniture in the lobby and guestrooms. Families will find faux-wood floors, old-fashioned Wildwood and Morey family photos and essential amenities within each guestroom. Step out the door and views of the boardwalk, beach and pool areas are immediate. BBQ grills, a fire pit, complimentary bicycles and beach chairs will have families spending most of their time outside of the accommodations during the days, and retreating only in the evenings for a comfortable, air-conditioned night’s sleep. 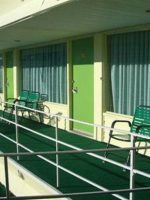 While dÃ©cor may seem dated, the environment and its many colors, textures and details take guests back to the 1950s, when a traditional motel had the simple features families needed for a fun trip to the Jersey Shore. The Blue Palms Resort and Boardwalk Bungalows has 73 rooms in total, spread across three floors within two buildings; the Blue Palms Resort building has 52 rooms and the Boardwalk Bungalows building has 21. All guestrooms feature microwaves, mini-fridges, flat-screen TV's, in-room safes and complimentary Wi-Fi, though only some rooms have DVD players. 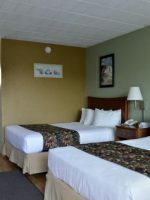 Guestrooms and suites are decorated with natural tones and faux-wood textures, and come with two double or queen beds; some have twin bunk beds. The family suites can sleep up to five and have kitchenettes with a two-burner stove top, microwave, mini-fridge, plates, cups and utensils for cooking small meals. A table with two chairs can be found in every room, and rooms with Murphy beds or sofa beds can be requested. Bathrooms are on the smaller side and have traditional shower and tub combinations and house the only sink/vanity in the room. Philosophy bath amenities are available and all have fun, inspirational sayings on them like "Celebrate Life." 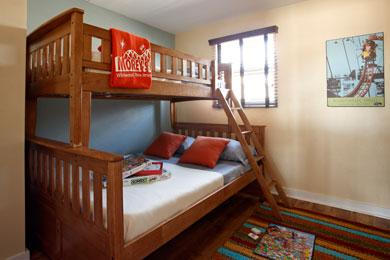 Cribs and Pack 'N Plays are complimentary upon request, though rollaway beds and cots are not permitted due to space limitations. 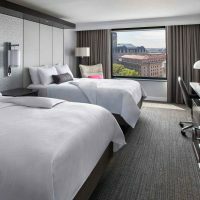 Some rooms have two flat-screen TV's, which make it easy for siblings to watch shows of their choice, though rooms do not allow for much privacy. All rooms are accessed from an outside entrance. Rooms on the second and third floors have balconies out front, equipped with two plastic chairs. Note: Although the hotel offers rooms that accommodate guests with disabilities, there are no elevators. Motel was a life-saver. The night staff helped us check in last minute. Suite was super-clean, and great for family use. We loved the little kitchenette, bunk beds, and multiple rooms. Pool outside was great for the kids. Was the perfect way to enjoy the board walk. We have stayed at the Blue Palms resort four times over the last three years. The resort is very nice clean & comfortable. 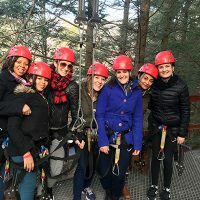 The staff was great friendly & professional. The resort is one block from the beach. They offer a nice continental breakfast along with tea coffee, bike & grill rental etc. which is nice. The staff is professional & friendly. The only negative thing I can say is the pool having a small space to swim in 4 to 5 feet then the pool drops to 9 feet which can be very dangerous for kids or an adult who's not an experienced swimmer. Other than the pool I would rate this resort a 5 star out of 5. When visiting Wildwood, the beach is a must. Located just one block from the free beach, the Blue Palms offers families complimentary beach chairs, boogie boards and beach toys. As the closest Morey's Pier property to the boardwalk rides and water parks, the Blue Palms Resort and Boardwalk Bungalows does not offer an onsite activities program for children. The motel does, however, offer two pools, one of which has a smaller, separate pool just for children. The pools range from 3 to 9 feet in depth, and the children's pool does not exceed 1.5 feet. Complimentary life preservers are available at both pools, as there are no lifeguards on duty. Showers are available at both pool areas for rinsing sandy feet, too. Lounge chairs, umbrellas and tables surround the pool area, and are available on a first come, first served basis. BBQ grills make meals during pool time easy and a fire pit is great for nighttime S'mores and sing-a-longs. The pools are open from 10 a.m. to 9 p.m. 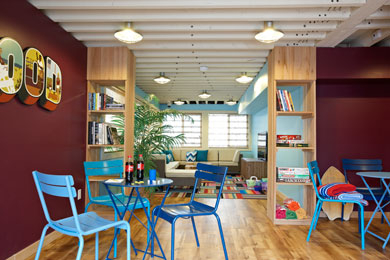 In the Boardwalk Bungalows building, families will find a game/activity room with a flat-screen TV, couch, tables, board games and a kitchenette. The activity room generally follows the same hours as the pools, 10 a.m. to 9 p.m., but if families are having fun, management will allow for later hours. Complimentary bicycles (with helmets) are available for families to use, as well. 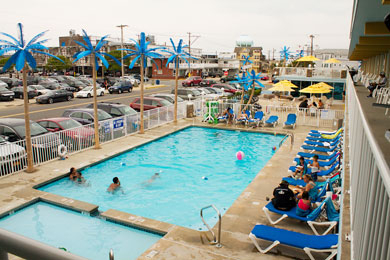 Since the Blue Palms Resort and Boardwalk Bungalows is a part of the Morey's Piers brand, guests are encouraged to purchase the Stay and Play Package (offered year-round), which offers guests discounted vouchers to the boardwalk rides at Adventure Pier, Mariner's Pier and Surfside Pier, such as the Giant Wheel, the Great Nor'Easter upside-down coaster or the Great White wooden roller coaster. Guests pick up vouchers at the front desk, and then redeem them at the ticket stands on the piers. The Blue Palms Resort and Boardwalk Bungalows does not offer an onsite eatery for families. However, between mid-June and Labor Day, a complimentary continental breakfast is served daily in the main lobby from 7:30 to 10 a.m. Families fuel up on bagels, muffins and coffee and juice. An alcove in the main lobby also provides guests with complimentary coffee 24 hours per day. 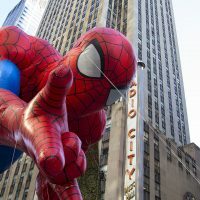 Be sure to stop at Wawa, 7-Eleven, or one of the two grocery stores (Acme or A&P) before getting to the hotel for snacks and small meal essentials. All rooms have microwaves and mini-fridges, which make simple meal preparation easy. Snack and soda machines are located on the ground floor, near the stairwells. The Blue Palms Resort and Boardwalk Bungalows does not have an elevator. Free Wi-Fi is available throughout the entire property, as are parking spaces (one per family), located along the perimeter of the motel. Washers and dryers are located on the third floor of both buildings and one load costs about $2.50 to wash and dry. Detergent is available free of charge at the front desk. Porta Potties are available right on the beach, though the hotel will always be about a 5-minute walk from your blanket or chair. 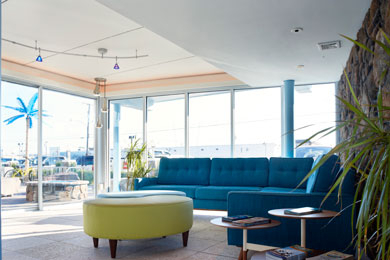 The Blue Palms Resort and Boardwalk Bungalows is only open weekly from May to October, and on select dates in between. 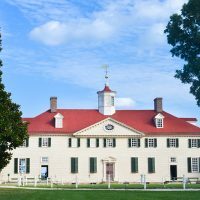 If possible, visit during May and the beginning of June for a quiet experience. September and October will also be quiet and comfortable, as most children are back in school. 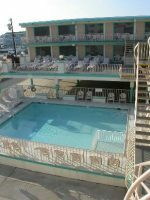 The high season for the Jersey Shore is July and August and guestrooms book quickly at the motel, since guests cannot beat the location. In the summer, the weather is sure to be sunny and warm, around 80 degrees, which makes for perfect beach days, and evenings will be cooler, especially on the boardwalk, so pack sweaters. Though beaches are sure to be crowded in July and August, there's enjoy space for families to easily find a spot. Lifeguards are on duty from Memorial Day to Labor Day, as well, with stations located every quarter-mile down the beach. Wildwood is located at the very end of the Jersey Shore, and the closest airport is Atlantic City International Airport, which services Spirit and United Airlines. The Philadelphia International Airport is 1.5 hours from the resort and services all the major airlines. A rental car will be needed to travel from the airport to the Blue Palms Resort and Boardwalk Bungalows. If coming from the south or west, take the Delaware Memorial Bridge and look for signs for the Garden State Parkway -- Wildwood is Exit 4B. If coming from the north, drive down I-95 to Exit 7 for the Garden State Parkway until exit 4B. Once in Wildwood, drive down New Jersey Avenue and turn left at Schellenger Avenue -- the Blue Palms is located two blocks down on Atlantic Avenue. Wildwood is easy to get around via foot, but bicycling is also big in town. You'll likely want a car for easy trips to local stores (just keep it at the hotel to avoid parking hassles). 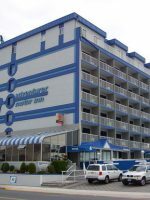 Walk to the beach and the boardwalk from the hotel or use the complimentary bicycles for seeing all of Wildwood. When walking the two-mile boardwalk, little legs may get tired. Pick up the tram, which runs 11 a.m. to pier closing time (about 1 a.m. during the peak summer season), and costs $3 per person, per ride. It will stop anywhere along the boardwalk. The Blue Palms Resort and Boardwalk Bungalows doesn't offer a babysitting service. 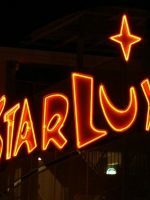 If the kids are old enough to watch themselves for an hour or two, take a stroll along the boardwalk or a romantic ride on the Giant Wheel -- both of which are just one block from the motel. If you're able to plan a date night, Jersey Girl Bar and Restaurant is just a two-minute walk from the motel and is known for a good happy hour.